Merton Historical Society is delighted to publish the first full translation of four medieval Latin documents which form the major part of College of Arms manuscript Arundel MS 28, which has been in the possession of the College in London since the 17th century. 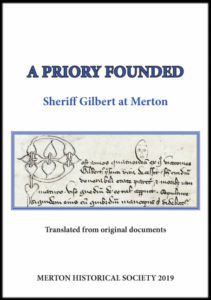 These documents deal with the earliest days of Merton Priory and with its founder, Gilbert, sheriff of Surrey, and reveal information previously known only to those who consulted the Latin text. Only the third text bears an original title, but the first, which is also the longest, could perhaps be entitled ‘In praise of Sheriff Gilbert’, being an account of Gilbert’s life and character and a record of his founding of the priory at Merton; the second text is in the form of an epitaph on the late sheriff; the third is headed ‘A letter from the venerable Gervase concerning the death of the sheriff Gilbert’; while the fourth recounts the vision of Walchelin, an elderly canon of Merton, about the deceased Gilbert. Scholars agree that the manuscript is a copy made in the 14th or 15th centuries from an original produced at Merton Priory in the mid-12th century. This edition includes an introductory essay. We are grateful to the College of Arms for permitting us to publish this work, and to include within it images from the document, including some fascinating scribal doodles. We are also grateful to Professor Marvin L Colker for allowing us to use his edition of the Latin text, and to Dr Simon Neal and Dr Tom O’Donnell for their initial work in translating these texts, which has been completed by our Chair, Keith Penny. Thanks are also due to Gaynor Taylor, who prepared a literal translation of the Epitaph, which Keith has paraphrased in verse in line with its original form. Above and detail on front cover: College of Arms Arundel MS 28 f.18v. See translation on pp.40-41. of Walchelin, an elderly canon of Merton, about the deceased Gilbert [page 41]. to the period before the intermittent civil war following Henry I’s death in 1135.
vision seen fourteen years after Gilbert’s death, so around 1139.
or glossing with Arabic numerals dates that are in Roman numerals in the text. later annotations were his work. within a shire, particularly in financial matters and in the enforcement of justice. revenue was unreconciled, and no debts remained to be cleared’ (I.24, I.28). reuniting the two lands, by which time Gilbert was certainly Henry’s man. things he bewailed the slippery paths of his former life, so badly lived’ (III.6). venial sins and penances unfinished in this life could be purged by refining fire. the advice of the Archbishop of Canterbury, staffed it with Augustinian canons. who wished to come, as he refused to have a gatekeeper (I.25). there was no church either. and therefore less flexible in making grants of it, especially to monasteries’ (I.16). authors shows familiarity with the Bible, with many allusions to Biblical passages. incarnation of the Eternal Beginning, on the third of May’ (I.6) . the blessings of eternal life. behind both the recording and the copying of these texts. school nor the Latin of the Golden Age, and thus not worth struggling with. superfluous words such as ‘then’, ‘therefore’, ‘now’, ‘the same’ and ‘aforesaid’. Cicero it is not, as one contributor remarked. verbs in I.33 is caused entirely by the author. be a literary exercise in the use of classical form and metre by a Merton brother. extant English epitaphs were produced (Bristol cathedral has a fine collection). in short, to make firm all doubt’ (I.34). buildings, by custom sufficient and suitable for a religious community. pray to God for a fellow worker to come to him. instead of ‘village’, as that often suggests a nucleated settlement. vill would be acquired for the servants of God and his most holy mother. persist fervently in good works, as far as was in their power. with a warm love of the place. there and devote attention to the pious acts which he had already begun. should be moved to and where vineyards could be made. by day, by the hands of the workers, to take on the appearance of beauty. been consecrated and established, the bishop returned home. and shelter from the storm and rain5 for the religious community of Merton. increased in resources and enlarged by several small possessions. Colker: Guy of Merton (1969). in their departure they brought most grievous loss to the community. how uncertain are the lofty heights of life. will appear in the following sections of the narrative. it. Those who died there were taken to be buried in surrounding villages. mother, and He speedily granted such relief as they needed. brothers, who, standing there, rejoiced in their solemn blessings. revealed, we can see that without doubt his future reward will be great. alacrity of his mind and the great generosity of his spirit in small matters. churches, but in fact misusing them in the pursuit of greater pleasures. endeavoured more eagerly to do whatever he thought he could to fulfil it. wanted, with a certain artfulness, to oblige him to promise greater things. reward and establish him with the elect in the loveliness of light. Christ would make him a co-heir in everlasting life.22 O happy exchange! given to his family members those things which he contributed to Christ? Gilbert be recognised for such a deed. anyone whose religious life and moral integrity deserved respect. to grant generously such good things as he could, to them as to the others. of this he obtained the daily, and indeed continual, blessing of his father. in the place that he himself had founded. have told this story just as we heard it from the sheriff ‘s mouth. he was loved, cherished and praised by everyone. with the same goodness grant the food that is needful for the day. day, if any such were present in a place where this could suitably be done. of lordship he caused three canons to be maintained by a daily allowance. almost fifteen days from leaving this present life, there was a great famine. orders in this matter and fulfil his will in all things concerning the poor. taxation revenue was unreconciled, and no debts remained to be cleared. so often referred to in this text. enter the gate of heaven. and they had never perceived in anyone such a pure grace of confession. their selves, thereafter conquered themselves for Your sake. and so, in order, they all came. was shadow, to open what was closed and, in short, to make firm all doubt. dominion is through all the ages. Amen. A sign and testament to Duty’s name. Whose life in Honour ended and began. To excellence mere rank could not compose. Though he alone endowed that sacred site. With alms from his own treasure freely paid. To God the Father’s realm of endless day. His piety o’erflowed and made things new. At ev’ry evil deed recalled again. The shadows dimmed the hero’s final light. Be my memorial, where God’s love leads. You solace, in a life that has no end. and the heading and first two lines of the letter of Gervase – showing scribal doodles. reader to weeping and tearful sighs. his life are fallen and full of many mournful miseries, without number! body was brought to us. that the bishop might return to his bed after the singing of the night office. and crying. The bed was bedewed, the pillows dripping, the linens soaked. himself does this, and not on account of their merits, which are worthless. the sadness of a praiseworthy end to our flesh. continually bore in his own body the cross of Our Lord. his hands on high, blessed the Lord and woke up, coming back to his senses. After he reached as high as he could he went further. Moderating the rule of law, rising above crimes by law. And often brought holy obedience to the law. Poor widows, supporting them with his funds. In religion, whence he climbed the road to the homeland. In this way he served many other churches. them he cried; he praised the Lord as he was about to die. At last the late light grew dark on the hero. Led by love of God, may you remember me, I pray. Giving you the consolation of eternal life. Amen. Above: College of Arms Arundel MS 28 f.19r. See translation on p.41. This entry was posted in Publications, Booklets, Publications, Hot off the press and tagged in hotoffthepress, merton priory.